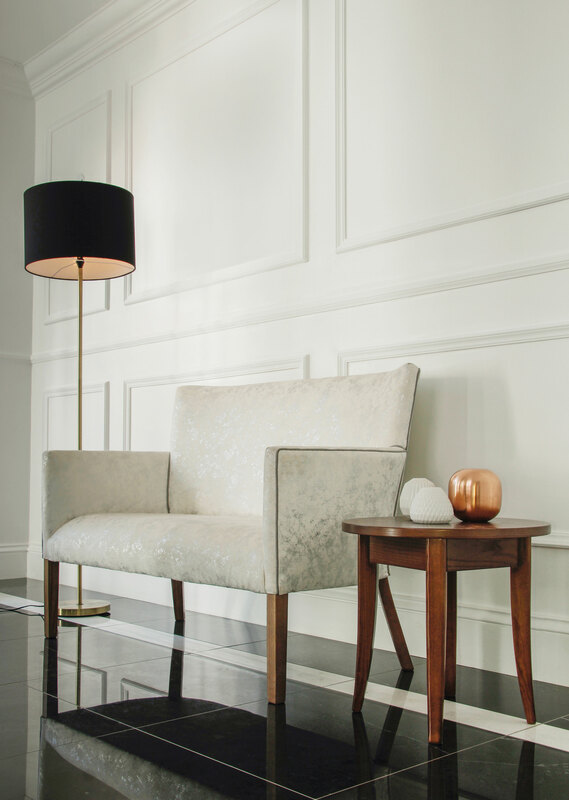 The Arabella Lowback Two Seater is perfectly proportioned for placement in small lounges, bedrooms and entrance halls. This popular fully upholstered sofa has a silhouette worthy of showing off and adding piping as a finishing touch is the best way to do this. This Arabella has been upholstered in a white velvet with silver marble detail with added silver piping detail to accentuate its curves and lines, and the wooden legs have been stained in Harvard Cherry which is a matt finish. It is flanked on either side by a floor lamp and side table for visual balance. The table is Woodbender’s Toscana round table, also in a matt Harvard Cherry finish, and it has been styled with copper and white ceramic accessories for a modern contemporary look. The standing lamp is bold in design and has a black cylindrical shade with copper inner.